In uncertain economic times like these, most people want, or need, to pull back their spending and save as much as possible. If you are like most people, trips to the supermarket eat up a lot of your money. But expert shoppers offer some tips for cutting your food bill. Don’t shop when you are hungry. You are much more likely to buy more food, and more expensive junk food and convenience food. Even if you have to stop on your way home from work, eat an apple or a granola bar before you grab that cart. And if you have children, you probably will spend less if you go to the supermarket without them. You’ll also be less distracted, and therefore more likely to make cost comparisons. Get a frequent shopper card. Most supermarkets offer free cards that let you take advantage of special sale offers that can really save you money. Get a card from every supermarket where you shop. In fact, if you go away for the winter or you stay in a condo for a week, get a card from the supermarket in your vacation destination. Check for sales. Look at the ads in your newspaper and watch the TV ads to see what is on sale. Often a particular type of item will be featured, such as paper goods or soda pop. Make note of what you need from those sales, and clip any coupons that apply. Make a list. In fact, make a couple. Draw up some menus and list the items you need to create those dishes. Check the refrigerator and pantry before you leave the house, so you know what items you need to replace. And then, stick to the list. In fact, you may want to cross each item off as you buy it, to give yourself a sense of achievement. Do the math. Some stores will post a price per ounce, for example. But if yours does not, be prepared to figure it out yourself. Will you save money on the giant box of detergent, for example, or on two of the smaller boxes that are on sale. Use your freezer. You often save money buying in bulk, and some deals – like any buy one, get one free offer – can only be enjoyed by buying extra. Just put the extra in your freezer for when you need it. Investigate the store brands. 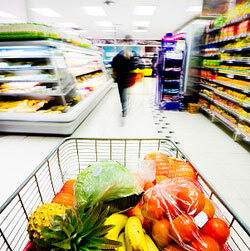 Many shoppers resist giving up a favorite name brand food for the store brand. But try it – who knows? For example, if you have teenagers, try the store brand pizza. They probably won’t care. Or try store brand napkins or garbage bags. But, first check to make sure that some sort of special offer doesn’t make the national brand cheaper at the moment. Finally, when you check out, watch the register. Prices don’t always scan correctly, especially on things that are on sale, and sometimes checkers accidentally scan an item twice.